A five-stop ticket through West Virginia trout streams. I live on the outskirts of the nation's capital, home to miles of asphalt and traffic jams. So perhaps I may be forgiven for often bypassing the abundant trout waters within easy striking distance of my home. Pennsylvania's got plenty of good trout streams, including the Letort, Falling Springs, Yellow Breeches, and Penns Creek. Maryland boasts Big Hunting Creek, Beaver Creek, and the Gunpowder River. And as a native Virginian, I take great pride in the Old Dominion's glorious trout waters, including the streams of Shenandoah National Park, Mossy Creek, and the Jackson River. Surprisingly, however, the state I most frequently prefer to fly fish is wild and rugged West Virginia. It might not often make the news, but West Virginia has streams with both healthy fish populations and good public access. The North Fork of the South Branch Potomac River—say that ten times fast—flows through West Virginia and eventually passes between Virginia and Maryland before it empties into the Chesapeake Bay. Though many anglers float the Potomac in Maryland and Virginia for smallmouth bass, there is excellent access for wading trout anglers off Route 28/55 in West Virginia. Here you'll find a healthy mix of brown and rainbow trout, with the occasional brood stock brook trout. West Virginia's own golden rainbow trout (elsewhere called a palomino rainbow) also populate stretches of the river. The state record 9.75-pound smallmouth was also caught here. Heading south on 28/55, you'll find excellent wading water along the North Fork. Numerous pullouts line the road; they are easy to spot and parking is abundant. Though the riffles seem to suggest that you should fish with drys, the water is actually better suited to nymphing. Unlike other sections of the North Fork, the Route 28 stretch is narrower and therefore doesn't allow for long casts. Instead, think short, technical casts in the 20- to 30-foot range. A word of caution: The North Fork is loaded with big rocks, many of which can't be seen when the river is running high—particularly in the spring or after a heavy downpour. If it's your first time floating the river, go with a guide or contact a local outfitter. Eagles Nest Outfitters, located near Petersburg, offers shuttle services on the North Fork. Good river access is available from River Road, just a few hundred yards south of the Cheat/Potomac Ranger Station. The area is popular with campers, but many fly fishers overlook it. There is a defunct dam approximately 11/2 miles from Route 28/55. For safety's sake avoid the area directly adjacent to the dam, and instead search the nearby shoreline, which offers long flats both above and below the old dam. You'll find deeper water opposite where you parked. In this part of the river, a 10- to 14-inch rainbow is a good fish. There is a private stretch of river at Harman's North Fork Cottages in the town of Cabins. The river widens considerably through this scenic area as it winds through a ravine of high cliffs and thick forest. Deep, boulder-strewn pools, riffles, and the occasional pocketwater stretch make for good dry-fly and nymph fishing throughout the season. The owner generously stocks the water with 16- to 20-inch rainbows for guests, a nice advantage if you need both accommodations and a quiet place to fish. Streamer fishing is also effective in the consistently deep water through this stretch—several pools are up to 40 feet wide, 200 feet long, and water clarity is good depending on the season. By contrast, fishing drys can be tough: A poorly presented fly puts these wary fish down. Upstream is Seneca Rocks, West Virginia's rock-climbing capital. There is a mile of public catch-and-release water here on national forest land, which sees some pressure from both fly anglers and tourists hiking along its easily accessible riverbanks. Bring along extra flies for the hungry canopy of trees. By late June the water often gets low. In the heat of summer, seek out deeper pools, and avoid fishing altogether when water temperatures meet or exceed 70 degrees F.
Seneca Creek joins the North Fork near the Seneca Rocks Discovery Center. This visitor center is operated by the Monongahela National Forest, and has an exhibit of Native American artifacts, maps of hikes in the nearby Dolly Sods wilderness, restrooms, and friendly rangers who can point you in the direction of local campsites, not to mention other fishing opportunities in the small streams of the national forest. Known locally as "the Lady," the Elk has numerous suitors, some of whom drive hundreds of miles to win her favor. Many consider the Elk one of the best trout streams in the East. If the native brookies don't grab your attention, then wild browns and rainbows, some surpassing 22 inches, certainly will. The Elk begins where Old Field Creek and Big Spring merge just a few hundred yards downstream from the Elk River Inn off of Route 219 in the hamlet of Slatyfork. Gil Willis, an Orvis-endorsed guide and owner of the Elk River Inn, introduced me to the river several years ago, and I have never seen its equal. The Elk has a catch-and-release-only section that begins at the headwaters and runs about 4.5 miles downstream before the river disappears into underground caves for several miles, leaving the riverbed apparently empty at times as though it has dried up. This section, appropriately named "The Dries," runs with good flow in the spring. Below The Dries is a second catch-and-release section, where the water flows back to the surface through three huge underground springs. There is good access available at Elk Springs Resort and Fly Shop, but be sure to stop in and ask permission before heading to the riverâ€”it's an easy walk from Dry Branch Road, adjacent to Route 219. Large rainbows—so large they might otherwise be mistaken for steelhead or wild salmon—lurk within sight of the fly shop. This portion of the Elk is catch-and-release for 2 miles before it hits Rose Run Bridge. Access is easy from County Route 49, which is directly past Elk Springs Resort. Parking and public access are available thanks to a collaboration between Trout Unlimited, the West Virginia Division of Natural Resources, and the Grafton family, who recently donated land for public use. Near the Elk's headwaters, rootwads and softball-size rocks make for excellent broken water. The Elk has deeper sections as well, but names like "Impossible Pool" demonstrate why anglers are drawn by its riffles instead. Nymphing is most effective here, and most of the Elk's heftier trout are caught after dusk. This lovely freestone trout stream near historic Lewisburg is one of only six spots in the Mountain State that offers a fly-fishing-only, catch-and-release section. Craig Miller, resident expert and owner of Serenity Now Outfitters (in Lewisburg), introduced me to it. 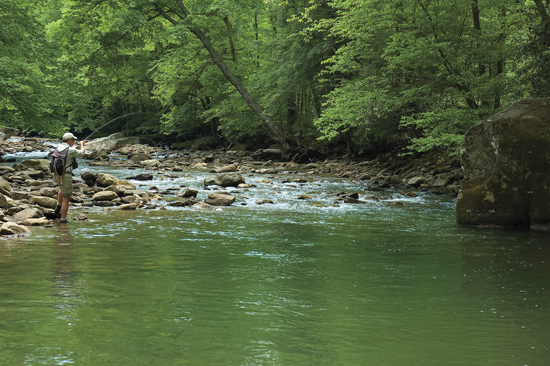 "Most people hear about Second Creek from a friend and just brush it off as another run-of-the-mill mountain trout stream and therefore never fish it," he says. "Those who actually take the time to fish here usually fall in love with the place." I officially belong to the latter category. The river can be broken into two sections above and below the low-water bridge, which you can easily drive across at normal water levels. Directly adjacent to the bridge is the Rice family home. You may fish in front of the house, which overlooks the river, but the owners request that you respect their privacy and park only in designated spaces. Downstream of the low-water bridge, you'll find long deep pools and a large oxbow just prior to a second elevated bridge. This bridge is not open to public traffic but can be used by walking anglers. The river is easy to wade and at some places is only 20 to 30 feet wide, and yet there's plenty of food for the local trout to eat and cover from predators. The river is packed with scuds and mayfly nymphs. I usually start fishing above an old hanging bridge. In its heyday the bridge no doubt provided a great observation point for spying on the river's wary trout; it has, however, long since fallen into disrepair and seems to be held together primarily by moss, lichen, and a few strands of rope. Spring and fall are prime time, but something's always biting on Second Creek. Water levels are so low in summer and winter that it's best not to use split-shot or even an indicator because the fish are easily spooked in the clear shallow water. This river has a solid population of browns—Miller has landed some pushing 22 inches—but rainbows and the occasional smallmouth also call it home. To access Second Creek from Route 219 heading south from Ronceverte, make a left on County Road 65 and then left onto County Road 62 to the low-water bridge. There is 1½ miles of fly-fishing-only water here, if you don't mind sharing the river with a few others, and it runs several miles before emptying into the Greenbrier, a noted smallmouth river. Second Creek's small size and high popularity mean that it can be tough to fish. Conditions also change faster here than on other streams so be ready to change tactics accordingly. Easy to access from Route 39, the North Fork Cherry River contains mostly stocked fish and isn't famous or popular. But what the Cherry lacks in accolades, it makes up for in beauty and accessibility. Route 39 is a busy road shuttling those traveling to and from Richwood. This area was once a logging hub, and Richwood still supports an active mill (along with a sign that announces the town's 100-year-old logging history). The North Fork Cherry runs along 39/55, with many spots to pull off. Take note of the unusual rock formations along the banks of the Cherry. They're not there by accident: Locals built the miniature obelisks from river rock. A good point of reference for anglers is the Gauley District Ranger Station, which has a helpful staff, bathrooms, and a small logging history museum just off the main information desk. The river runs directly behind the ranger station and through the Monongahela National Forest. Behind this ranger station there is good dry-fly water with 8- to 12-inch rainbows. You'll occasionally catch larger brood stock here as well. Cover is tight on the North Fork Cherry, so rein in your backcast. The Cranberry is a beautiful stretch of river with great trout fishing, but it's no secret so you'll likely have to share the water. To improve your odds of catching fish, and to cut down on your wading partners, try the fly-fishing-only Dogway Fork section. To access the Cranberry use Cranberry River Road, just pass the Gauley Ranger Station prior to Richwood on the right. The road is clearly marked, but it leads you through a residential area; as a result, it's easy to miss your turn onto Forest Road 76, marked by a small sign. If you don't make this turn, you'll eventually run out of road, leaving you in the middle of nowhere on the side of a mountain. Go ahead: Ask me how I know this. The Cranberry has lots of places to camp and fish. I like the Woodbine catch-and-release section that runs 1.5 miles downstream to Camp Splinter. To access the Dogway Fork fly-fishing-only water from Woodbine, stay on the gravel road that parallels the Cranberry for about 8 miles and then terminates at a locked gate. You can then hike, bike, or horseback the 11 miles to Dogway Fork. A second access point is from Dogway Road near the top of Kinnison Mountain from Route 39. This road is located above Richwood just prior to Route 150 (also known as West Virginia Scenic Highway). Once you reach the locked gate on Dogway Road, hoof it 6 miles to Dogway Fork. Oak Myers, owner of Cranberry Wilderness Outfitters and a local guide, says that he and his clients often bike into this pristine area. Although this fishery is tough to reach, it's worth the effort for the scenery, solitude, and of course the trout. Tight cover and classic mountain trout water complete with riffles and pocketwater characterize the Dogway Fork section, so practice your rollcasts. Although the Cranberry has brown and rainbow trout ranging from 10 to 15 inches throughout, the Dogway Fork section produces mostly diminutive wild brookies. The watersheds of neighboring West Virginia Pocahontas, Pendleton, Grant, and Randolph counties all share similar hatches. In late February Blue-winged Olives (#16-20), Quill Gordons and Hendricksons (#12-16), and Little Black Stoneflies (#12-14), arrive and continue through March. From the end of May to early July, March Browns (#12-14) and BWOs appear. West Virginia's best-known fly tier is Charlie Heartwell. In June, his Green Drake Emergers and Sulphur Spinners (#8-14) are a must for matching local hatches. Throughout the summer and into fall, terrestrials dominate the menu. Use spiders, brown and tan Elk-hair Caddis, and ants (#14-20). For nymphing, use Beadhead Prince Nymphs, Pheasant Tails, Hare's Ears, and Copper Johns in sizes 12 to 18. Also fish black and brown Woolly Buggers and Goldilox streamers in sizes 6 to 10. A few factors affect conditions on individual streams: First, West Virginia isn't called the Mountain State for nothing. Localized rain and runoff causes some rivers to be full at the same time that others are low. Second, on the Slatyfork section of the Elk, in particular, think small—down to size 26. Use tiny Pheasant Tails, micro CDC Emergers, and size 22 to 26 Black Beauties. On Second Creek carry and fish scuds in sizes 18-22. On the Cherry, Cranberry, and Second Creek, use 2- to 4-weight, 61/2- to 8-foot rods. The canopy can be thick on the Cherry and at Dogway Fork, and heavy brush and briars come into play on Second Creek. I use weight-forward floating lines, and carry split-shot for fishing nymphs in deeper holes or fast current. I mostly use 9-foot leaders and 4X to 6X tippets. The Elk and North Fork South Branch Potomac are larger rivers, requiring 5- to 7-weight rods up to 9½ feet long. These rods are better for casting and fishing larger streamers and nymphs. These rivers can swell with spring runoff and early-season rains, so bring along sinking-tip lines in April, May, and June. In faster sections of the Potomac, I like the indicators made by Floatmaster since they seem impossible to move once placed on your line. The Elk and the Potomac allow for longer casts, but both can still be a challenge; particularly the Elk, with its abundance of wild fish. Use longer leaders (up to 12 feet) and tippets as thin as 6X. Fishing licenses. You'll need a West Virginia license and trout stamp and, on some rivers such as the Elk, a national forest stamp. Purchase your license online at: wvfish.com. If the current state of the economy has put that dream destination a little further out of reach, don't despair: wild, wonderful West Virginia's easily accessible trout streams are, relatively speaking, just around the corner. Beau Beasley is the director of the Virginia Fly Fishing Festival and the author of Fly Fishing Virginia: A No Nonsense Guide to Top Waters. This is his first contribution to Fly Fisherman.